Well, at something like sixty-one hours since I arrived in Lawrence, I feel like I’m finally caught up and into the swing of things. 1pm – back from lunch, gather in the lounge for critiquing. 5:15 pm – critiques finish, discussion keeps on going. 8:30 pm (approx) – back to campus after dinner. And when you add the time that I’ve been putting in reading other people’s stories and figuring out what I want to say about them in my critiques… it definitely takes up a lot of the day, not to mention just sitting and talking with other writers. I’m probably going to blow off the group dinner tonight, just because I’m not a fan of mexican, so probably that’ll mean a bit more time to myself to write this evening. I’ve almost got my critiques ready for today, and it’s only 10am, so that’s great. Aliens on Pern, here I come! But I’ll tell a bit more about the critiquing process first. Everybody takes turns going clockwise from the person who wrote the story – there’s no reading out loud, since everybody’s had the stories to read by themselves – and can say whatever they like, as long as it’s constructive, though a lot of people have adopted a kind of ‘good news, bad news’ approach, starting with things they like, then the things that they think would improve the story, and maybe finishing off with one more nice compliment. Chris M, who runs the workshop, always goes last, and often takes a tangent to give us all some advice or present a resource like a list of senses to try appealing to in your writing. The first day, I just came up with some synopses, (which I didn’t share with the group,) and my likes and issues list. Since then, I’ve actually been working off my printouts, mostly because I want some excuse to actually hand them back to the writers and not have to hang onto them, so they’ re mostly more filled with my reader reactions than copy-editing points, and anything that qualifies for the likes and issues list, I retype into a new file. My second story is up today – I hope it goes pretty well. This one, I have slightly higher hopes in than the first day’s story, so it might be a bit harder to take if the criticisms are serious, but I think I just need to keep in mind that everything is usable, and nobody’s really trying to tell me off or put me down, just to help. So, let’s see. The flight from Charlotte to Kansas City went okay – had my carry-on bag taken as checked luggage because I was in a late zone to board and the lady at the gate desk thought there wouldn’t be space in the overhead compartments. Ended up switching to the aisle seat because a couple had booked seats that were on either side of my original spot, and that worked out pretty well. Kept reading workshop stories off the Kindle for most of the trip, except when the ‘no electronic devices’ sign was on, when I read Harry Potter. I called the Ground Transport people while the plane was taxi-ing up the gate to let them know that I was arriving, but hung up while the guy was still looking up my details, because I didn’t want to spend more than one ‘roaming minute’ on the call – they’re pricy enough as they are! It turns out that someone tried to call me back, and I didn’t hear the phone buzzing, but more on that later. So, I waited a bit impatiently for my chance to rush off the plane with my laptop bag, just because I was excited, even though I suspected that I’d be waiting for a long time at baggage claim, which I was. So I turned and introduced myself, and sure enough, he was my towncar driver, and led me over to where he’d had to park, a little ways from the baggage carousel. We got the bags in the trunk, me with the laptop case in the back seat, and I went to switch from the prescription sunglasses back to the ordinary glasses. Uh-oh! Something wasn’t right with the glasses. It turned out that somehow the left lens had popped out without disturbing the frame, which was a new one on me. I tried to pop it in a few times during the hour-long drive to Lawrence, then gave it up, spent some time chatting with the driver, and read more from “Sergeant Chip” on the Kindle – that’s a professional story that we’re going to be reading and discussing on Friday. The driver dropped me off right outside Templin Hall, got my signature, and I brought the suitcases up to the doors. Some people who were hanging out in the lobby let me in, and I headed up to the third floor in the elevator, and found the welcome workshop party in full swing. Met the workshop leaders, a few of my fellow short fiction workshoppers, had pizza and a can of diet orange pop. At around that point, I decided that I should head over to Lewis Hall and get myself checked into the residence room. That went well enough, the girl behind the desk found my name, gave me the little envelope with the key-card for the residence front doors and a room key. Once I’d got back to Templin, I’d stowed the envelope and forgotten the room number, but when I dug the envelope and checked the room number, it turned out to be for a room that was already fully occupied. So a larger group of us headed back to Lewis – Chris M, the short fiction workshop leader, one of the people who’d already moved into the room, (it was a married couple, so the husband decided to come,) and a workshop alum who was hanging around as a facilitator this year. Chris M also called Lydia, who was the person who’d taken all the applications online and made all the room assignments, but wasn’t around working on a Sunday evening. It took a while to sort that out, and I ended up sitting over in the Lewis lobby and talking with the facilitator guy, who’s also been a Nanowrimo participant. Eventually I got moved into a suite that could take four at a pinch and had only one British man in it so far, so now we’ve each got a bunk bed room to ourselves, and are sharing a bathroom. So what else? I got unpacked, including the box that I mailed to myself weeks ago, found out that the sheets I bought at Zellers aren’t really the type I thought they were, but got them to work anyway. Registered and paid the high price for residence internet – tried to get my old wireless router to work, but I think that they’re not going to play nice together. One of the guys in our workshop was really counting on sharing wireless internet, especially having it available in our classroom, but I think I’m just as happy having the resnet via cable. So I hung around a bit longer, listening to conversations more than participating, put myself to bed, woke up pretty early with the morning light outside my window. Now I’ve had some of the leftover pizza for breakfast, and showered, and the first full day is stretching before me. I’m so excited – I can’t wait! I’m in the Charlotte airport, with about 45 minutes before my flight for Kansas City leaves. It’ll be boarding soon, but I might be a bit late for the boarding call. I’ve been trying to get the wifi working for a few hours now, since we landed, and now it’s finally up. For a long time, I could connect to the CLTNET, but not actually get any internet from it, either DNS or anything else. I’m not sure if it just came up all over, or if the fact that I’m trying from this spot, near the plaza side of concourse C, is the key factor. I don’t much care. I was a little frustrated by the fact that the general ‘business center’ in the plaza was closed and unattended (because it’s a Sunday afternoon?) and the only information kiosk was on the other side of the security checkpoint. I had no intention of going through the X-ray machines again just to ask a question, of someone who might not have an answer. And the US Air club lounge definitely had internet, but would have made me pay $50 for the day pass. So that’s why I decided to try the wi-fi about as close outside the club lounge as I could find a seat. I’ve found the local number for the town car company in Lawrence, which is the thing I really wanted to get online to check. And I’ve posted this little rant, and I might look for some info on how to get my sansa MP3 player to shuffle before I go. Hmm… this hasn’t taken long so far. Maybe I’ll be nearly on time for boarding after all. This was an idea for a fan fiction story that I had been mulling over for a long time before I finally started to set it down on New Year’s eve, 2004, with the encouragement of a great friend in the Roswell fandom community, TrueLovePooh. In fact, it was actually one of those stories that had two ideas thrown together to see what became of them. The (first!) Kansas stories binder. Well, it’s less than 36 hours before I leave to go to Kansas, now. a 500 pack of laser and copier paper. a 1 inch 3-ring binder. I got most of the stories printed out Wednesday evening and Thursday morning, but I didn’t begin to punch the holes or put them into the binder until tonight, and I quickly realized that the one binder wasn’t going to be enough. I’ve punched out and inserted 245 pages by my count, but the binder’s nearly full, and the 24 stories in all total 475 pages. I do want to get everything into two binders if I can, especially since the schedule given is that half of us will get their stories critiqued on any given afternoon, in the same split, so I can have one binder for the on-days and one for the off-days. It actually looks like my best strategy will be to get a larger binder, (an inch and a half?) for the group that I’ve started on, since that one has some longer-winded scribes, and keep the one-inch binder for the other side. It’s starting to settle in on me just how much writing we’re going to be going through, and it’s something very different than I’m used to organizing at one time. I’ve grown accustomed to the idea of running off half a dozen or more copies of my own story to take to one of the critique groups here in town, but Kansas CSSF is obviously a very different kind of thing. So, I’d better get myself to the store early tomorrow. Well, looks like I was so busy with rewrites and starting off the ‘Harry Potter’ review series that I missed a milestone – this blog turned one year old on June 10th. Happy Belated Anniversary to me! So, to commemorate the occasion, I’ll link back to three of my favorite memories for each month, June 2010 to May 2011. The very beginnings of my blogging journey. My very first (and most popular) Beat Sheet – Serenity! My trip home from Toronto CSTS 2010 and the G20 riots. Another beat sheet – The Simpsons Movie! 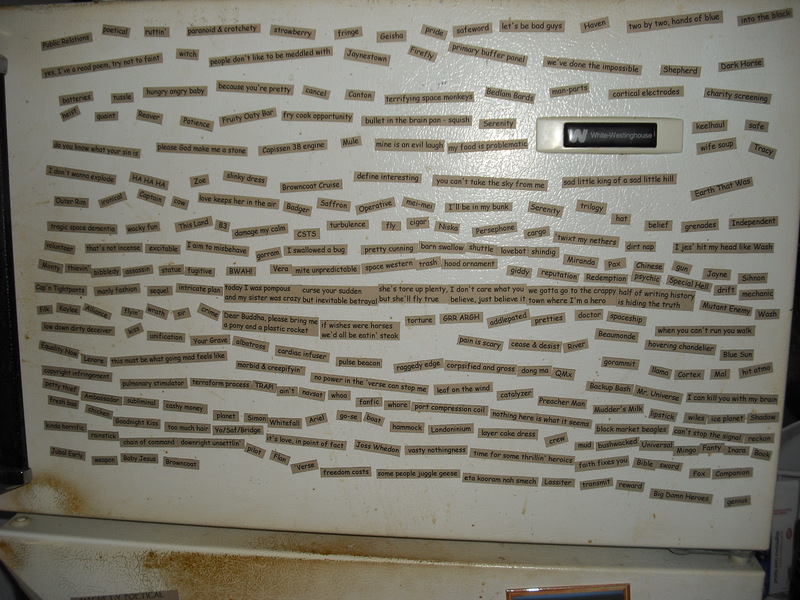 So, one of the things I bought at the CSTS charity auction this past weekend was a set of Firefly ‘fridge poetry magnets’ – a huge set of little phrases and words that could be stuck on any suitable surface and rearranged together. 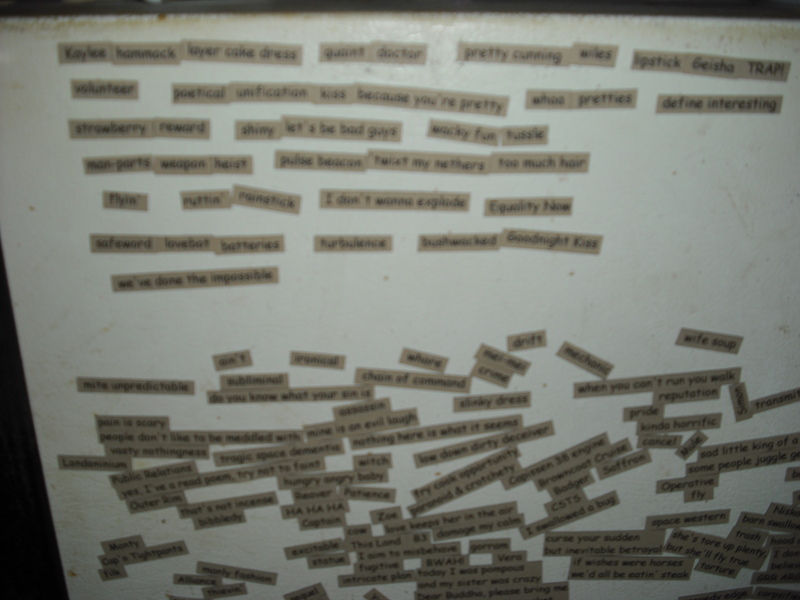 I thought that I’d chronicles a few of my adventures in fridge magnet poetry here. Been busy for the past several days, so I’m only covering two chapters this time. Chapter Four: In Diagon alley, Harry revels in the feeling of independence away from school and Privet drive, both of which, in different ways, full of people telling him where not to go, what to eat, and when to wake up. He does Hogwarts homework in the ice cream shop patio, he people-watches the witches and wizards, and he manages enough willpower not to spend his parent’s inheritance on a new professional-grade Quidditch broom. He gets his school books, and finds out that Hagrid’s birthday present, the impracticably monstrous ‘Monster book’, is the textbook for ‘Care of Magical Creatures. He also has a strange premonition among the divination books, that could be interpreted as a death omen. Hermione and the entire Weasley clan show up the day before Harry’s to leave with Hogwarts, and he’s excited to be reunited with his best friends. Hermione goes looking for an early birthday present at the pet shop, and ends up with a big ginger cat, who likes Ron’s rat Scabbers rather too much. Ron isn’t happy about that and worries that Scabbers will get eaten before long. That night at the Leaky Cauldron, Harry goes back downstairs to look for Ron’s rat tonic that he dropped, and overhears Mister and Missus Weasley talking about Sirius Black and why the Ministry of Magic are convinced that he’s out to kill Harry. Harry immediately connects all the dots about why Fudge was acting so relieved to see him, how this means that he won’t be let out of Hogwarts until Sirius is back in Azkaban prison, and tries to keep himself from entirely panicking. Chapter Five: Everybody heads out to King’s Cross station for the Hogwarts express, and on the platform, Mister Weasley tries to warn Harry about Sirius. Harry admits to having overheard, and Mister Weasley tries to get Harry to promise that he won’t go looking for Sirius. Harry is startled at the thought, but he has to run for the train and doesn’t actually promise. On the train, he tells Hermione and Ron about the connection to Sirius and ‘You-know-who’. My father was born in Liverpool, England in 1937. His parents ran a post office there. When he was in the local high school, ‘grammar school’, he was one year away from Paul McCartney, who he thought was a nice chap and always thinking about his music. Dad got a Doctor of Philosophy in Applied Mathematics from Oxford, and came to Canada to work. He was hired by McMaster University here in Hamilton, and met my mother when he started attending the same church as she did. When McMaster got their first computing machine, my Dad was one of the first faculty transferred to a Computer Science department. From my first memories of him, Dad was always very soft-spoken and calm. He walked a bit slowly, had a permanent hump or hunch in his upper back, and didn’t drive because he was blind in one eye and didn’t have any depth perception. He would get from our house on Stanley avenue to campus and back every day, though, and I think I got some of my attitude about public transit from him. For a while, when I started going out to special schools with gifted programs in Westdale, near the university campus, we would sometimes be on the same bus in the morning or afternoon. In the fall of my senior year of high school, Dad fell when trying to climb back up the basement stairs, and ended up in hospital, and caught a bad infection while he was there. He ended up with a tracheotomy and got a little portable text-to-speech machine with a keyboard because he wasn’t able to talk any more, and he could never really get around entirely on his own after that. But he still had a great attitude about life, especially once he got back home. You are currently browsing the The Kelworth Files blog archives for June, 2011.